http://abitterdraft.blogspot.com/2013/06/review-and-goodreads-giveaway-city-of.htmlCity of Scars is the first volume of the Skullborn Trilogy, an all new epic fantasy adventure from the author of Blood Skies, Steven Montano.City of Scars takes place in a world known as Malzaria. Thirty years prior to the outset of the story, the world was at war with the Blood Queen, whose sole desire was destruction. The prologue gives us a look into the Rift War, as it was later called, through the eyes of Colonel Corgan Bloodwine, an officer in the Jlantrian army. Jlantria, the White Dragon Empire, is your typical empire - expansionist shiny-armored soldiers led by a demigod Empress who wields impressive magical skills. The world, having been ravaged by the Blood Queen's war of conquest, is in the process of rebuilding when the real story begins.Azander Dane is the primary protagonist. Dane was a member of the Dawn Knights, a disgraced order of elite soldiers that had been disbanded by the Empress some years past for certain brutalities they committed that are explained throughout the novel. Immediately upon meeting him, it is easy to tell Dane is truly haunted and scarred by his past and so his quest turns out to be one of redemption for both himself and his order. The Dawn Knights were some of the few people allowed to train in the ways of magic, or as it is known in City of Scars, The Veil. Dane's development as a character shines in his quest for redemption. He makes decisions his old self wouldn't make that show a distinct change in his character. 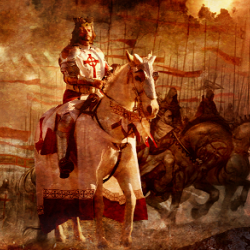 Though we don't know much about his past yet, we see into his mind as he thinks about decisions he's making, and Montano really did a great job creating this tragic hero.The magic system is probably the greatest strength of the novel. By Touching the Veil, one can do almost anything, from teleporting to deflecting projectiles via forcefield, hurling a fireball, or even tracking living things. Touching the Veil is not your traditional fantasy magic, where you can just do it - by using it, you drain the very life force from the world as well as yourself. I've always been a big fan of magic systems that don't just allow you to cast and cast until your enemy is dead. From when I first read about Raistlin Majere in Margaret Weis & Tracy Hickman's Dragonlance series', where Raistlin was visibly drained and internally damaged whenever he used his magic, though most other uses of magic in the series were conventional. Other magic-users in City of Scars include Bloodspeakers and Veilwardens. Veilwardens are elite users who appear to use magic the same way that Dane does, but Bloodspeakers are different. Bloodspeakers are born with the Veil in their blood - they don't draw their power from the world, but from their own life force. When their well of magic runs dry, they die.Ijanna Taivorkan, the other primary protagonist, is one such Bloodspeaker, and she is known as the Dream Witch, the one whom Azander Dane is hired to hunt down. Ijanna is an incredibly powerful Bloodspeaker, and she is wanted by every organization in Malzaria because she is prophesized to sacrifice herself to 'eradicate the evil left behind in the wake of the Rift War'. Naturally, she doesn't want to die, so she needs to find an alternate route to fulfill the prophecy. Most of the points of view were given to Dane, with the remainder being spread across Ijanna and some minor characters. This didn't leave much for development in terms of the Dream Witch, and I think the story would have benefited from an extra hundred or so pages. While some minor characters didn't quite seem necessary, some were easy to become attached to, one of them being Kath, a young member of Ebonmark's city watch who is inadvertently (or maybe not so) linked to Ijanna and her mission. I have a strong feeling that the next in the series, Path of Bones, will shed much more light on some of these unnecessary-feeling characters.Malzaria is filled to the brim with unique cultures and races. From the enormous ebon-skinned Voss to the barbaric Tuscars, the cannibalistic Chul and the giant insectoid nek'dool, Steven's worldbuilding continues to be top-notch. Not only does he create these cultures and races, he incorporates exotic and deadly weapons such as the shek'tar, vra'taar, and even the chemical weapon known as Serpentheart, which dissolves its infected from the inside out.Steven Montano creates another fast-paced, gritty thrill ride in City of Scars, whose last 100 or so pages proceeded at a breakneck pace. 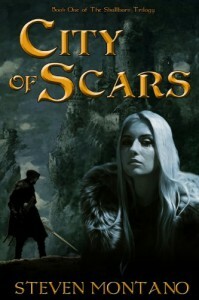 For fantasy fans looking for something unique and fresh to escape from the prophetic orphan farm boy, look no further than City of Scars.I'd like to thank Steven for the ARC and opportunity to participate in the release events and for writing such compelling stories!